When day in and day out your job is to find furniture and home accessories for people (and write about it too)- you are bound to get whiplashed by so many transient inspirations that you want to change your house around every few weeks. This drives Andrew practically insane. We buy a rug and three weeks later I “hate it” and want a different one. Poor man. So here I am, with my next question I’ll put out to you all,because when you are too close to something, you can’t really see it clearly. * repaint them-very carefully– a glossy kelly green. Green is just a bit more “me” and I think it would look stunning against the brown and tan linen zebra and white woodwork. Or will I get sick of this too? * repaint them white. Kind of–blah. * Ebay them and buy new chairs. The question here is shipping- I would have no idea how to do that. 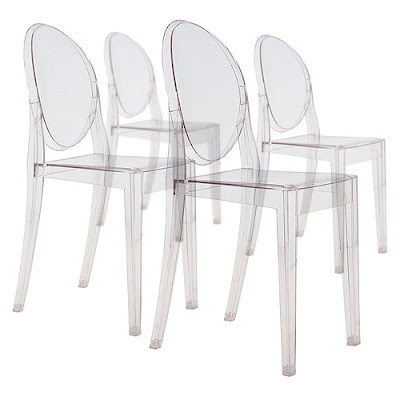 2 Louis Ghost armchairs and 4 or 6 Victoria Ghost chairs in either clear or white. 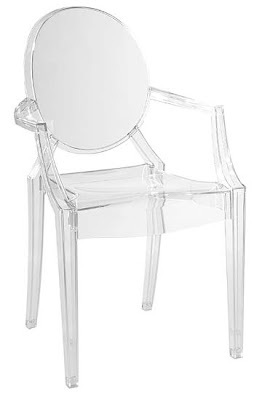 Andrew thinks it is simple ridiculous to pay such an exorbitant price for PLASTIC CHAIRS. But I think these will be “antiques” someday. 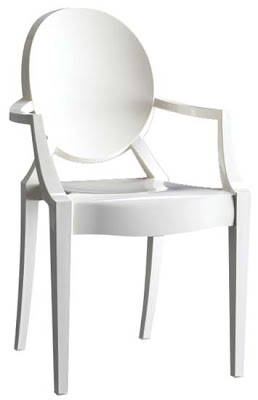 6-8 armless shell chairs in white. 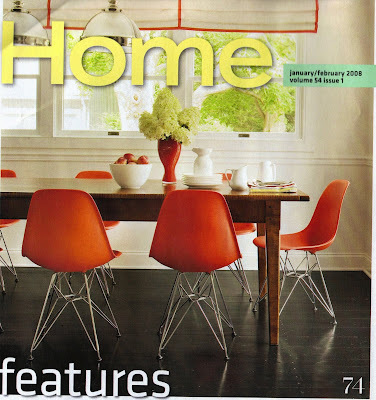 I am just so crazy for this picture on the cover of Home, which is what drove me to this option. First, I love your chairs the way they are now. However, if you want a change, I think you should re-paint. Kelly green would look very pretty. I personally don’t like the ghost chairs. They’re to…picnicy for a dining room. I do have a sneaking suspicion that I will sit in the ghost chairs and slide right off and break a tooth. I’d say definitely go with the Kelly Green. Although I still don’t understand the Zebra obsession, I think green would fit much better with the dynamic of your house, rather than the current red or the ghost chairs. I think the green would work great on your chairs. Also, where did you find your dining room light fixture, I love it! It’s West Elm! I think it’s still online too- very reasonable! I say sit on the decision for awhile. Make sure you are good and sick of the current ones before putting out more cash and expending moretime on new ones. I am not one for comfort over style. I always said men don’t notice comfort from across a crowded room. That said however, the red shell chairs you showed as option #3 do not look inviting to me. They look like waiting room chairs from the lates 1970s. Paint your chairs black. If they were mine, I would change a zebra. 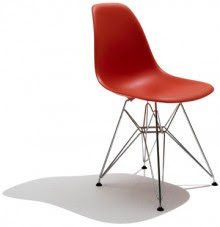 I think each chair in a different colour fabric (red, pink, violet, orange – all hot colours) will look great. Or paint chairs in zebra look. You should DEFINITELY NOT get rid of them! You worked way too hard on them. Paint them GREEN (what can I say, I love brown and green together, those were my wedding colors!). I think you’ll get sick of the other options, and they’re not as easy to “re-do” as the chairs you have…plus hello? Sentimental, those belonged to my grandparents!!! Ok, so maybe you could send them to me!! PS- what about doing a soft turqoise color…do you still have that going on in your living room at all? that would be a nice blend with the zebra print…which i LOVE. OK, jury is in. The chairs are STAYING. Andrew actually wanted me to sell them, but I think I will keep them and go green! I’ll patch test over the weekend! Thanks for all your input! Well, the walls are actually light beige, not yellow. I was going to put up grass cloth wallpaper, but I think I may paint that upper part chocolate instead. Still undecided there too. This dining set was given to us by my hubby’s grandfather and it’s not our style, but we’re trying to make it as “us” and hip as we can. We will get a new table someday, but for now it stays. 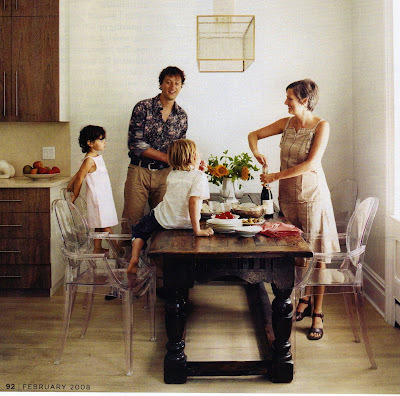 I do love color and would love to keep the chairs a color- but you are right, trends change. White is safe- but a bit boring for me. And I was never sold on teh red but thought it would make the most sense. We hsall see. I am so happy to hear everyone’s feedback!! I think you should paint the chairs the color of the zebra stripe ( I can’t tell from the photo if the fabric is black or brown.) The shape of the back is interesting, the zebra fabric is the bit of quirk that you want, and then let your table setting be the color that you change out seasonally. I agree with the other design addict. Zebra is timeless. You will get tired of colored chairs again. But bright flowers on a table never go out of style.